Part haunted house story, part searing cross-dimensional love story, The Ghost and Mrs. Muir paints a wonderfully textured gothic romance with all the intrigue and heartbreak of a steamy romance novel. But with Mankiewicz's moody tones and Bernard Herrman’s typically entrancing music, the movie waxes and wanes with much emotional grandeur. Gene Tierney, as Mrs. Muir, is a recently widowed mother, who leaves her former life behind to live in a hilltop Victorian seaside house. The landlord is not shy to inform her that the ghost of the former owner, a grizzly but handsome seaman named Capt. Daniel Gregg, continues to inhabit the house. But ironically, Mrs. Muir loves the idea of a house with 'character'. The ghost is quick to make his presence known and introduces himself to the lady. The ghost then inspires Muir to express her creative side by 'ghost' writing his memoirs. Meanwhile, Miles Fairley, a smarmy fellow author whom she meets at her publisher's, pines after Mrs. Muir with a suspicious aggressiveness. His possessiveness slowly comes to bear under the nose of Muir. Of course, Daniel notices and knows the truth about Fairley but needs Muir to discover the truth herself, no matter how painful that will be. As the ghost/former sea captain, Rex Harrison embellishes all the clichés of a gruff sailor with charm and scene-chewing delight. Under the Hollywood production code, a surprisingly lustful sexual desire between him and Mrs. Muir is buried beneath the surface. Part of the deal between Muir and Gregg is that he can appear only in Muir's bedroom, which brings its own naughty connotations. In fact, one could argue Mrs. Muir is drawn to the ghost by a deep sexual attraction she never experienced with her former husband. Her drab marriage is characterized by a statement to her landlord – that her pregnancy with her daughter 'just happened'. And the dirty old sailor even remarks about observing Muir's naked body, but can't touch it. Under the direction of Mankiewicz the production design and lighting of the grand old house contributes as much to the gothicness as the salacious material. The exterior backdrop behind the grand bedroom changes from lovely sunset to harsh lightning storms to foggy engulfments in order to express the mood of the scene. The night time moon, which comes in through the window as it reflects off the bustling waters, creates some deliciously expressive shadows at night. 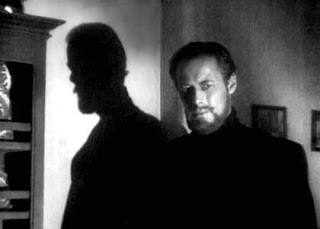 But the film is made memorable by the genuine relationship that emerges between the ghost and Mrs. Muir. The emotional climax hits a surprisingly profound moment when Capt. Gregg says his painful goodbye to her while she's sleeping, asking her to “choose life”. This is one of my favorite movies of all time. If you haven't seen it, you are missing something!